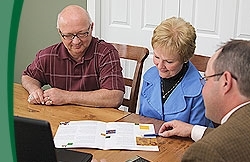 Retirement represents a major financial transition. There are so many things to take care of, and so much knowledge to acquire. That’s why it’s important to find the right retirement advisor - a professional who can give you the time, care and insight you need. My clients have the advantage of working with a caring professional who takes the time to get to know them, their goals and their values. More importantly, I listen ... to learn about their retirement dreams, and work to create strategies to help realize them. If business or legal matters must be addressed, the first step is finding the right resources. In addition to providing my clients with financial advice, I often help to steer them in the right direction by way of my professional relationships with legal and accounting specialists.